As you can probably imagine, a compromise of a PeopleSoft system is pretty much a worst-case compromise for an organization. When Renato got involved in the incident he described on Monday; he was surprised that the “only” thing he found was a crypto coin miner. An attacker would probably have been able to do a lot more damage to an organization by exfiltrating the data that lives on the system, or worse, modify it. The vulnerability exploited, CVE-2017-10271 has a CVSS score of 9.8 (Critical) and is easily exploitable. In October 2017 Oracle released a patch as part of its quarterly Critical Patch Update. End of December, Lian Zhang, a Chinese security researcher, released an exploit script to take advantage of the exploit. Lian's post may not be the first, but this looks like the exploit that was used in the attack discussed here, and the post appears to have started an increased interest in this flaw. Lian’s blog is talking about CVE 2017-3506, but the exploit matches CVE-2017-10271. Oracle’s April CPU patched CVE 2017-3506, but it didn’t do so completely, leaving an opening that let to CVE-2017-10271. Either way, you could probably call it either vulnerability. The cause is as so often insecure deserialization. Oracle’s fix was to add a validate method that checks an object is passed, and if it is, then it will throw an exception. Probably the best blog I found about these two vulnerabilities and how they relate is the one by . hxxp://www.viewyng. com/includes/libraries – base URL for another victim. Still reachable as of today (1/9/2018). The miner, xmrig, is not exactly malware. It is a legit crypto coin miner for Monero. The miner comes with a configuration file showing us where the money will go that is mined using this application. Renato was able to recover one such configuration file, and the pool the miner was connecting to does show that up to this point, 611 Monero coins were mined by this user, which amounts to about $226,070 currently. The hash rate of this user of 450 KH/s would only support $31k per month so that this user may be at it for a while, or some systems were already cleaned up and are no longer participating in the effort. Renato also recovered files from another campaign using the same vulnerability. This group opted for mining AEON instead of Monero. Even though they are achieving a similar hash rate, they only earned about $ 6k so far. Maybe they will switch to Monero after reading this. The exploited vulnerability affects WebLogic, but we did see some PeopleSoft servers exploited. PeopleSoft, being a very complex application, is difficult to patch and maintain. The exploit bash script will “register” new victims with the attacker’s server, and we managed to get a hold of one of the logs left behind by the attacker. The log started on January 4th and 8 am ET. It is still seeing new connections right now (January 9th 8 am ET). The last log I retrieved includes 722 IP addresses. Based on a quick reverse DNS lookup and an ASN lookup, I found a high concentration of affected IPs at cloud providers. This isn’t a surprise since many organizations are moving their most critical data to the cloud to make it easier for the bad guys to get to it. 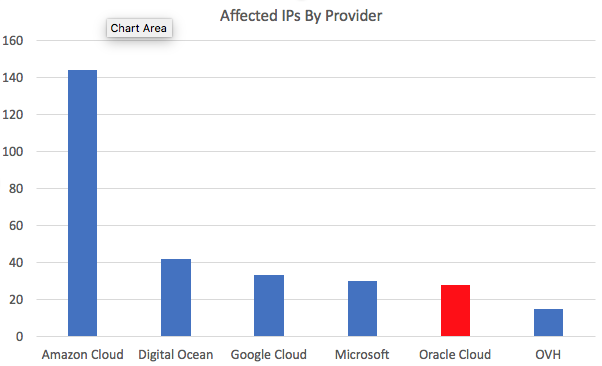 Also, not a big surprise is the relatively high percentage of IPs in Oracle’s cloud. The exploit does attack a key Oracle component. The victims are distributed worldwide. This isn’t a targeted attack. Once the exploit was published, anybody with limited scripting skills was able to participate in taking down WebLogic (/PeopleSoft) servers. Please DO NOT stop your incident response by removing the miner. Your server was vulnerable to an easily executed remote code execution exploit. It is very likely that more sophisticated attackers used this to gain a persistent foothold on the system. In this case, the only “persistence” we noticed was the CRON job. But there are many more, and more difficult to detect, ways to gain persistence. Thanks to our readers who helped us out with this by sharing details about this intrusion. Also thanks to Renato who wrote this up initially and provided much of the data used here. Thanks to Team Cyrmu’s IP to ASN conversion tools.